Ants as social insect live in colonies which are generally well protected by the combined defensive mechanisms of its individual members. Nest sites are generally a limited resource for ants . Crematogaster ant is specific for the Macaranga plant [2,3], pine trees  and also the Acacia . Nests are found in a range of sites including in soil with or without coverings, in cracks in rocks, and arboreally in trunks and twigs. The abundance of ants in tree crowns is surprising because ants, with their movable brood, were originally typical ground arthropods, specialized in building their nests in soil or using natural cavities in dead wood [6,7]. Ants build different types of nest structures, including above-ground mounds built from organic materials or a set of subterranean chambers. These structures may differ in their ability to insulate the colony against temperature extremes. Species forming mound nests also need organic materials and therefore are expected to display distributions that closely match those of trees and shrubs . Nest architecture in fungus-growing ants is important not only for the ants but also for their fungal cultivars, which require particular environmental conditions [9,10]. In addition, the presence of nest mates is thought to increase survivorship and pathogen resistance [11,12] because all grooming might be facilitated by increased group size [13,14]. The development of strategies allowing ants to construct nest sites independently of available cavities was one of the most important evolutionary steps towards the permanent conquest of canopies . Undetermined fungi were frequently found growing inside the nests of Crematogaster sp. As these fungi were only detected in well-developed in the innermost part, it seems unlikely that they stabilize the nests, as it is the case in other carton building ant species. Huxley further suggested that the ants might feed on the spores of one of the fungi, which was growing parasitically in the tubers of Myrmecodia spp. The aim of the present work was to evaluate the efficacy of the isolate actinomycetes the three selected Entomopathogenic fungi, Metarhizium anisopliae, Beauveria bassiana and Lecanicillium lecanii. Nest material of Crematogaster rogenhoferi were collected from the community forest of Sohmynting Village Jaintia Hills of Meghalaya in the month of May-June (2014). The nest materials were collected in sterile container and brought to the laboratory for investigation. Small pieces of nest carton were taken and sterilized by dipping in 10% sodium hypochlorite for 3-5 minutes and washing in 2 or 3 series of sterile water then placed on the surface of Sabouraud Dextrose Agar (SDA) plates. These plates were incubated at room temperature (28-30°C) and observed periodically. The growing of fungal hyphae developing from the nest disks were then transferred aseptically to a fresh SDA. The fungi were identified following sporulation and pure cultures were stored at 4°C on SDA plate. The isolated fungal strains were cultured on SDA plates at 26°C for 7 days to observe colonial morphology. Microscopic morphological characteristics such as size and shape of conidia, mycelia septation, and pigmentation, were used to identify fungal isolates were described according to the method established by Wipornpan et al. . The test fungal cultures were inoculated into freshly prepared SDA plates (fungal strains) using sterile cotton swabs. The purified extract obtained by the evaporation of the ethyl acetate extract was dissolved in 1 ml, 0.2 ml phosphate buffer. Then the wells were made (about 5 mm in diameter) on the inoculated plates using cork borer and each well was loaded with 100 μl of culture supernatant. The plates containing fungal strains were incubated at room temperature for 5-7 days. After incubation, the zone of inhibition was measured and expressed as millimeter in diameter . The center of SDA plates was point inoculated with test fungi and antagonist isolates were point inoculated at the periphery of the plate. Each plate was incubated at 28°C, for 72-96 hours in an inverted position with a slight modification. The zone of inhibition of the fungus around each isolate was measured. Microscopic observation (1000X magnification) after Gram’s staining revealed that the isolates is a Gram-stain-positive and rod-shaped microorganism . Other morphological characteristics such as colony characteristics, type of areal hyphae, aerial mass colour, and growth of vegetative hyphae, reverse side pigments, fragmentation pattern and spore formation  (Figure 1). Figure 1: Morphological characteristics of isolated fungal from the nest material of C. rogenhoferi. Seven fungal species were isolated from the nests material of Crematogaster rogenhoferi; these are Acremonium spp., Mortierella spp., Mucor spp., Trichoderma spp., Aspergillus spp., Penicillium spp., and Absidia spp. Acremonium spp., Trichoderma spp., Aspergillus spp., Mucor spp and yeast spp. There were also certain yeasts and some non sporulating fungi that inhabited the nests material (Figure 2). Figure 2: List of some actinomycetes isolate from the nest material shows different structures under microscopic observation (1000X magnification). All seven strains of the isolates (actinomycetes) were screened against the three selected entomopathogens the Metarhizium anisopliae, Beauveria bassiana and Lecanicillium lecanii respectively. Amongst this 45% showed antifungal activity against the fungi. The antifungal activity of the isolates against the pathogenic fungi was good. The culture supernatant of the isolates also showed good antifungal activity (Table 1 and Figure 3). Table 1: Antifungal activity of isolates actinomycetes against the three selected entomopathogens - well diffusion method. 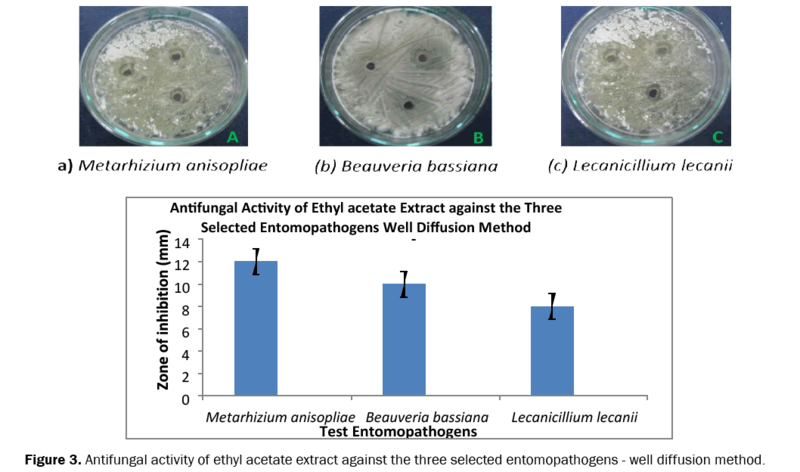 Figure 3: Antifungal activity of ethyl acetate extract against the three selected entomopathogens - well diffusion method. The antifungal activity of the isolates actinomycetes was confirmed by growing with the test cultures Metarhizium anisopliae, Beauveria bassiana and Lecanicillium lecanii respectively. All the isolates showed antifungal activity against the test organisms was found to be effective (Table 2; Figures 4 and 5). Table 2: Antifungal activity of isolates actinomycetes against the three selected entomopathogens - Dual plate assay method. Figure 4: Antifungal activity of isolate against the three selected entomopathogens - Dual plate assay method. Figure 5: Antifungal activity of isolates actinomycetes against the three selected entomopathogens Dual plate assay method. This is the first assessment to reveal that diverse actinomycetes can be readily isolated from the nest material of arboreal nest building ant. Our isolates displayed predominately gram-positive antagonism; however, it is not clear if this activity arose from one or multiple antimicrobial compounds. Streptomyces spp. is capable of producing over different antibiotics , with some strains producing multiple antimicrobials . From the collected data it was well conclusive that the results indicate that the active isolates were found the produce antifungal activity against the three selected emtomopathogens. This may be due to their extracellular metabolites of altering its permeability or due to the suppression of spore germination or the diffusion of antibiotic produced by local isolates into the medium which effect the growth of fungi. Because of such complexity, further studies relating to extracts from our isolates, produced under numerous culture conditions, would need to be conducted to understand the mechanism behind the bioactivity displayed in our assays. Most of the strains we isolated belong to the genus Streptomyces, consistent with similar studies investigating nest associated insect material. This includes those studies relating to leaf-cutter ants [22-25], wood boring beetles [26-28], honey and stingless bees [29,30], solitary bees [31,32], digger wasps , mud dauber wasps [34-36], and termites [37,38]. Furthermore, a study by Ruddick and Williams , suggests that spores of Streptomyces spp. are associated with the cuticle of many arthropods. While relatively little is known about how arboreal ant nest building control nest hygiene [40,41], Hoggard et al. found that nest building wasps produce active cuticular antimicrobial compounds. This may preclude the need for a symbiont to produce such compounds. Our data shows to be consistent with other studies relating to actinomycetes of other insect nest substrates, suggesting arthropod nest material is a habitat for culturable, allochthonous actinomycetes that include Streptomyces as well as other, rarer genera [22,29,32,37,43], regardless of potential symbiotic associations. Future studies characterizing the antimicrobial activity witnessed in our studies will be necessary to determine if the actinomycetes isolated within this study produce novel chemistry. By further targeting the full diversity of the microbial community associated with these arboreal ants, we will be able to better understand how these arboreal ants maintain nest hygiene, and what microbes may impact their fitness. This growth inhibition show the active isolates of actinomycetes can be investigated for use as biofungicids. However, this strain in our study needs further investigation for active component of antibiotic production. Actinomycetes isolate from arboreal ant carton nest of Crematogaster rogenhoferi are very potential in producing valuable secondary metabolites like antibiotics. Even though lot of antifungal antibiotics available in the market, still the problem in controlling the fungal diseases not gets an end, this is because of drug resistance by pathogens. So, in order to overcome these problems, there is a need for searching new and newer compounds from the new habitats like arboreal ant carton nest. Authors thank to the Head and Dr S. R. Hajong, Supervisor, Department of Zoology, North Eastern Hill University, Shillong, India for providing the laboratory facilities. Author’s woe their special thanks to Prof. H. Kayang and his students, Department of Botany for helping in the culturalization and identification of fungus isolated. The financial support from DST (SERB), New Delhi is highly appreciated. Philpott SM and Foster PF. Nest-site limitation in coffee agroecosystems: artificial nests promote maintenance of arboreal ant diversity. Ecol Applic2005;15:1478-1485. Holldobler B and Wilson EO. The Ants. Springer, New York. 1990;p:732. Fiala B, et al. Diversity, evolutionary specialization and geographic distribution of a mutualistic ant plant complex: Macaranga and Crematogaster South East Asia. Biological Journal of the Linnean Society1999;66:305-331. Tschinkel WR. The natural history of the arboreal ant, Crematogaster ashmeadi. J Insect Sci2002;2:1-15. Palmer TM, et al. Short-term dynamics of an acacia ant community in Laikipia, Kenya, Oecologia2000;123:425-435. Wilson EO. Some ecological characteristics of ants in New Guinean rain forests. Ecology 1959;40:437-447. Sudd JH. Nest construction in ants. Proc IUSSI1977;pp:173-176. Maggini R, et al. A stratified approach for modelling the distribution of a threatened ant species in the Swiss National Park. Biodivers Conserv 2002;11:2117-2141. Bollazzi M and Roces F. Thermal preference for fungus culturing and brood location by workers of the thatching grass-cutting ant Acromyrmex heyeri. Insectes Soc2002;49:153-157. Bollazzi M, etal. Soil temperature, digging behaviour, and the adaptive value of nest depth in South American species of Acromyrmex leaf cutting ants. Oecologica 2008;158:165-175. Hughes WOH, et al. Trade-offs in group living: transmission and disease resistance in leaf-cutting ants. Proc R Soc Lond B 2002;269:1811-1819. Yanagawa A and Shimizu S. Defense strategy of the termite, Coptotermes foumosanus Shiraki to entomopathogenic fungi. Jpn J Environ Entomol Zool2005;16:17-22. Schmid-Hempel P. Parasites in social insects: monographs in behavior and ecology. Princeton University Press, Princeton 1998. Traniello JFA, et al. The development of immunity in a social insect: evidence for the group facilitation of disease resistance. Proc Natl Acad Sci USA 2002;99:6838-6842. Orivel J and Dejean A.Selection of epiphyte seeds by ant-garden ants. Ecoscience 1999;6:51-55. Wipornpan P, et al. Morphological and molecular characterization of Colletotrichum species from herbaceous plants in Thailand. Fungal Divers2005;18:117-133. Mohanraj D, et al. Bioprospecting of actinobacteria from Yelagiri hills with special reference to antibacterial activity. J Chem Pharm Res 2011;3:439-446. Hucker GJ and Conn HJ. Methods of Gram staining. Technical Bulletin of the New York State, Agric Exp Station1923;p:93. Shirling EB and Gottlieb B. Methods for characterization of Streptomyces species. Int J Syst Bacteriol1966;16:313-340. Watve MG, et al. How many antibiotics are produced by the genus Streptomyces? Arch Microbiol2001;176:386-390. Seipke RF, et al. A single Streptomyces symbiont makes multiple antifungals to support the fungus farming ant Acromyrmex octospinosus. PLoS ONE 2011;6:e22028. Haeder S, et al. Candicidin-producing Streptomyces support leaf-cutting ants to protect their fungus garden against the pathogenic fungus Escovopsis. Proc Natl Acad Sci USA2009;106:4742-4746. Barke J, et al. A mixed community of actinomycetes produces multiple antibiotics for the fungus farming ant Acromyrmex octospinosus. BMC Biol2010;8:109. Zucchi TD, et al. Isolation and characterization of actinobacteria ectosymbionts from Acromyrmex subterraneus brunneus (Hymenoptera, Formicidae). Microbiol Res2011;166:68-76. Kost T, et al. Non-speciÞc association between Þlamentous bacteria and fungus-growing ants. Naturwissenschaften 2007;94:821-828. Hulcer J, et al. Presence and diversity of Streptomyces in Dendroctonus and sympatric bark beetle galleries across North America. Microb Ecol 2011;61:759-768. Scott JJ, et al. Bacterial protection of beetle-fungus mutualism. Science 2008;322:63. Grubbs KJ, et al. Genome sequence of Streptomyces griseus strain XylebKG-1, an Ambrosia beetleassociated actinomycete. J Bacteriol2011;193:2890-2891. Promnuan Y, et al. Actinomycetes isolated from beehives in Thailand. World J Microbiol Biotechnol2009;25:1685-1689. Gilliam M and Prest DB. Microbiology of feces of the larval honey bee, Apis mellifera. J Invertebr Pathol1987;49:70-75. Batra LR, et al. The mycoflora of domesticated and wild bees (Apoidea). Mycopathol. Mycol Appl1973;49:13-44. Inglis GD, et al. Aerobic microorganisms associated with alfalfa leafcutter bees (Megachile rotundata). Microb Ecol1993;26:125-143. Kaltenpoth M. Actinobacteria as mutualists: general healthcare for insects? Trends Microbiol2009;17:529-535. Kumar V, et al. Actinomycetes from solitary wasp mud nest and swallow bird mud nest: isolation and screening for their antibacterial activity. Ann Microbiol 2011. Kumar V, et al. Taxonomy and antimicrobial activity of moderately salt-tolerant and alkaliphilic Streptomyces sp. MN 9(V) isolated from solitary wasp mud nest. Ann Microbiol 2011. Poulsen M, et al. Chemical Analyses of waspassociated Streptomyces bacteria reveal a proliÞc potential for natural products discovery. PLoS ONE 2011;6:e16763. Bignell DE, et al. Isolation of facultatively aerobic actinomycetes from the gut, parent soil and mound materials of the termites Procubitermesaburiensis and Cubitermes severus. FEMS Microbiol Lett1991;85:151-159. Visser AA, et al. Exploring the potential for Actinobacteria as defensive symbionts in fungus-growing termites. Microb Ecol2012;63:975-985. Ruddick SM and Williams ST. Studies on the ecology of Actinomycetes in soil V. Some factors inßuencing the dispersal and adsorption of spores in soil. Soil Biol Biochem1972;4:93-103. Turillazzi S, et al. Antibacterial activity of larval saliva of the European paper wasp Polistes dominulus (Hymenoptera, Vespidae). Insect Soc2004;51:339-341. Turillazzi S. Polistes venom: a multifunctional secretion. Ann Zool Fenn2006;43:488-499. Hoggard SJ, et al. Social complexity and nesting habits are factors in the evolution of antimicrobial defences in wasps. PLoS ONE 2011;6:e21763. Kaltenpoth M, et al. Symbiotic streptomycetes in antennal glands of South American digger wasp genus Trachypus (Hymenoptera, Crabronidae). Physiol Entomol 2010;35:196-200.